CMA CGM Group is pleased to announce that the CMA CGM MARCO POLO, the world’s largest containership, has begun its first voyage yesterday, Wednesday, November 7th, in Ningbo, China. Operated on the emblematic line of the Group, the « French Asia Line » (FAL 1), the CMA CGM MARCO POLO will call at Ningbo (7 nov), Shanghai (9 nov), Xiamen (11 nov), Hong Kong (13 nov), Chiwan (13 nov), Yantian (15 nov), Port Kelang (19 nov), Tanger (6 dec), Southampton (10 dec), Hamburg (12 dec), Bremerhaven (14 dec), Rotterdam (16 dec), Zeebrugge (17 dec), Le Havre (19 dec), Malta (26 dec), Khor Al Fakkan (5 jan), Jebel Ali (7 jan) and Ningbo (23 jan). 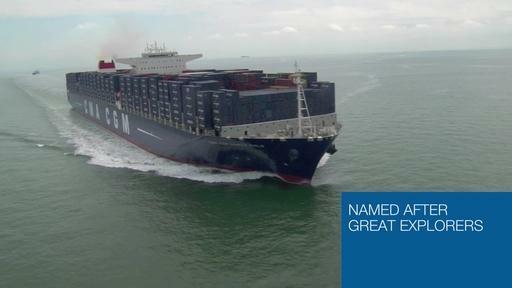 The FAL1 operates the largest vessels of the CMA CGM fleet and offers its customers a fixed-day, weekly connection between Central and South China, the main exporting zones of the country, and Northern Europe. The direct service to Southampton and to Hamburg offers European importers the fastest transit times of the market.